Diary of James Moore of the Lakewood area of Ellsworth, Maine. He kept his diary very intermittently until 1901 when he became more conscientious about keeping it up. If you look closely at the above image of the front cover, you will see his name, twice. 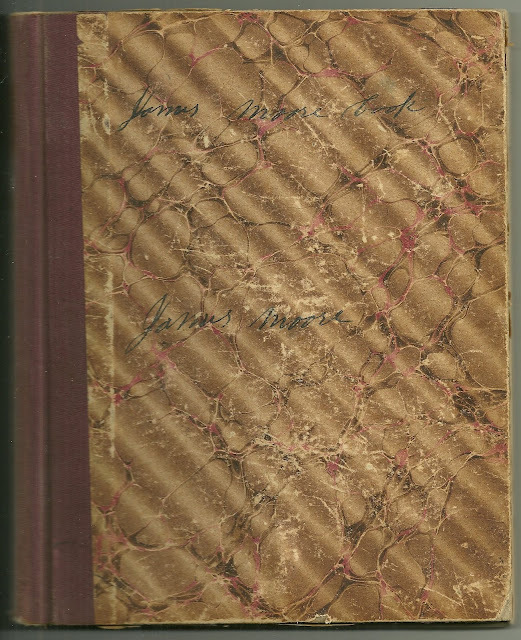 This diary was found with four other diaries that were kept by James' daughter-in-law Vesta Estella (Garland) Moore. James Moore was born 30 May 1837 in Maine, the son of Gary Townsend Moore and wife Miriam (Garland) Moore. His paternal grandparents were John, Jr. and Polly (Townsend) Moore. His maternal grandparents were Josiah and Sarah "Sally" (Swett) Garland. On 21 August 1858 James married Laura Ann Garland, who was born 5 February 1838, at Ellsworth, Maine, the daughter of Leonard Jarvis Garland and wife Azuba A. "Zuby" (Moore) Garland. Her paternal grandparents were Josiah and Sarah "Sally" (Swett) Garland. Her maternal grandparents were Edward and Elizabeth B. "Betsey" (Maddocks) Moore. James Moore died 27 March 1903, an event that a reader of the diary knows, sadly, is coming. His wife Laura Ann (Garland) Moore died 22 May 1921. If you have any corrections and/or additions to the information presented here, please leave a comment or contact me directly. Wednesday, June 5, 1901. I have planted our beans today. Scott is to work on the new road by Joseph Mercer’s putting in a bridge. All the [?] is on the old road. John D. Moore is farming for Abi Garland today. I drove Chary, our red cow, down to Jamie Moore’s to his Holstein bull. Tuesday, June 11, 1901. Sowed our Hungarian and grass seed in the [Weston or western] field. Saturday, June 15, 1901. We sowed corn fodder. Sunday, June 16, 1901. Laura and I went to Jordan Bridge in Mariaville where Jellison woman was drowned. Then went up to Trout Brook to Charles Silsbury and got dinner. Then went to the Tilden Schoolhouse to the Sunday School and prayer meeting. June 17, 1901. We sowed a [? piece?] of Hungarian in the upper field. Whitmore Garland fetched Leonora and two of the children down home and come down and got them tonight. Tuesday, Ellsworth. June 18, 1901. We sowed some a piece of Hungarian. Finished farming. Only our turnip. Cecil and Wesley Moore come up here today and Cecil went to school all day with Nora. Wesley went half day, then went home. Cecil carried Whitmore Garland’s seed sower down to his father tonight. Sunday, June 23, 1901. The free Christians Conference closed here today. John Richardson and Mrs. Giles and Steven Rankins and wife stopped with us through the meeting. James S. Garland is quite sick. Laura and I called to see him. Alanson Jordan and wife was there. Monday, June 24, 1901. I sowed our turnips today. Ellsworth, June 25, 1901. Tuesday. Nora Moore went down to the high school with Letty Moore and [? Linda? Lawler?] Fletcher. John R. Moore fetched Nora home tonight. I have been mowing beside the road. Scott been hauling kill wood to Hosy Phillips. Wednesday June 26, 1901. Very warm day. 112 in the shade. I been to work on hay. Scott Moore has been down town with a load of kill wood. Ada Garland come up to our house with the horse and wagon and got Laura and Vesta Moore and carried them down to the Schoolhouse. Mary Garland and Aunt Edie Garland and Aunt Thankful Moore was there. Mary Garland was taking count of the books. June 28, 1901. Quite warm. Circus in town today. I went down town today. Laura went down to Fred Frazier with me. Almer Row gave me a pair of forward wheels to make me a hand cart. Scott Moore been to work on the new road this forenoon. The heat took holt of him. He had to go to bed. Gary Moore Road might indicate the area in which James Moore lived and farmed.